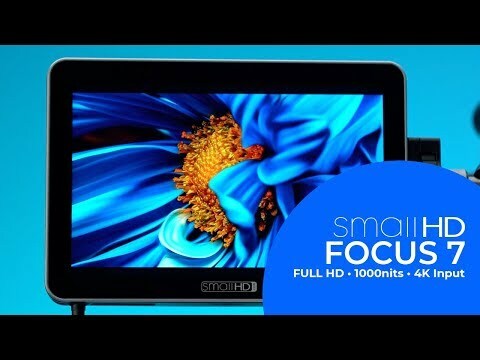 The FOCUS 7 on-camera monitor features a 1000-nit bright, 1920x1200 resolution, IPS LCD touchscreen display. With full-size HDMI input, it is capable of accepting video up to 4k resolution at 30fps. The 2 integrated Sony L Series battery slots are conveniently hot swappable. In addition, this monitor provides a 3.5mm barrel output that can supply power to small DSLR and mirrorless cameras, using battery specific adapter cables. Mounting solutions for the FOCUS 7 include (4) each 1⁄4”-20 threads and an optional Tilt Arm mounting accessory. Customized for the 7” touchscreen, the new Tilt Arm utilizes the camera’s cold shoe and provides friction-based tilt for easy monitor adjustments.